The CTNext Board of Directors has approved a $2 million implementation grant for Hartford/East Hartford’s Innovation Places initiative for fiscal year 2018. 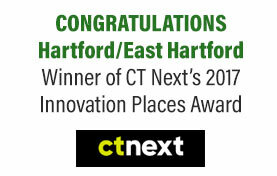 Senator John Fonfara, who was instrumental in designing and passing a comprehensive law to help Connecticut embrace the innovation economy, applauded the decision by CTNext to invest in the Hartford area. This video produced by General Electric, explores a world where brilliant women in science are treated like stars. The company has set goals of having 20,000 women in STEM roles by 2020 and obtaining 50:50 representation for all our technical entry-level programs. In Connecticut, companies like Farmington-based United Technologies Corp. are committing to gender parity in its corporate leadership, with the goal of having half of its top roles filled by women by 2030. As part of its pledge, UTC is joining the Paradigm for Parity coalition, whose members aim to have 30 percent of corporate leadership positions filled by women, and adopting a five-step plan geared towards achieving gender parity across the organization. UTC said it already has 27 percent of its corporate leadership positions filled by women and is targeting 50 percent by 2030. Read about it on HartfordBusiness.com.